For Beat the Bus no 3, I was inspired by Karen O’Brien who said in Sydney Commuters “Glebe to Martin place. Bus in peak hour 45 min. Riding 20 min” That’s enough of a win to get the re-elected Jamie Parker and Jenny Leong, Greens members for Balmain and Newtown back on their bikes riding to the NSW Parliament. For this challenge I was clueless as my only Glebe biketrail was the beautiful Black Wattle Bay shared path. So I went with the system for challenge two, start at the Glebe town hall. After looking at my map for 20 minutes, I decided the best way was to head straight down St Johns Rd and get some car relief at Wentworth Park. Then I would go down the back streets in Pyrmont and head to the Pyrmont Bridge. 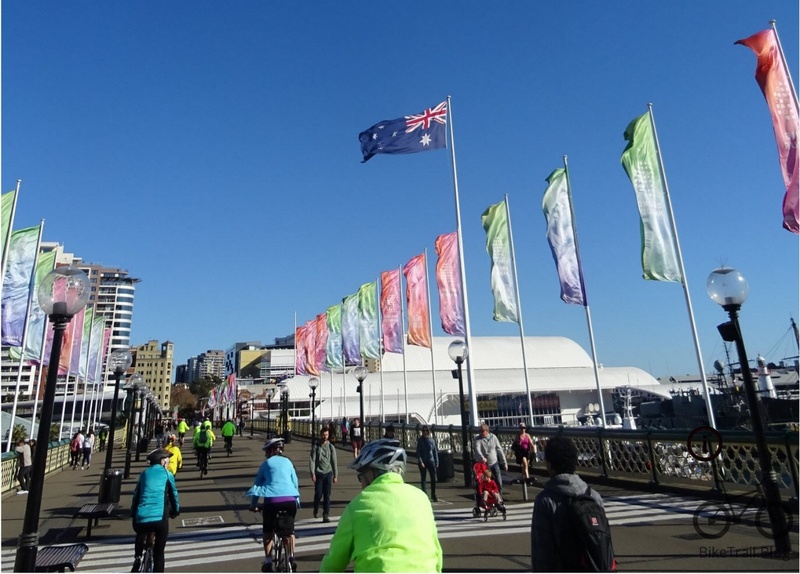 From Pyrmont bridge, the shared path heads over to Kings St where I could see some bike infrastructure. That was all the information I needed, I headed from Centennial Park to Glebe through Sydney University all on shared paths. Then I toddled down some lovely back lanes in Glebe to the Town Hall. Started Strava, take a screen shot of the bus options and I was ready to go (slowly). St Johns road was fine. It was all downhill, Wentworth Park was a dirt track, there was a really steep hill into Pyrmont but guess what, there is a Lift and a pedestrian road bridge that negates that. I had an eBike, no hill is a problem. Riding the back streets of Pyrmont is OK and I made it to Murray st and then the Pyrmont Bridge. The cycle path up King St is good till Kent street then it stays shared for a 100m and fizzles out and its into the traffic you go for 200m. I arrived at the Pitt St Mall and went the wrong way up Pitt and I was at Martin Place. All up it took me 19 minutes so Karen has the right time. The bus times at 3pm were listed at an average of 25 minutes so we “beat the bus” to Martin Place. Looking at the bus time tables in more detail, the further you are from Parramatta Rd, the longer it takes so I would say to anyone who lives in Glebe, think about a bike ride to work. To the Green MPs, Parliament House is at the end of Martin Place, enjoy the ride to work.